The principle is that when you add more of one good, or one action to a process, each addition unit being added produces less of an output than the previous unit did. As the return on each additional unit decreases, there will come a point where more units will not add any more output, and in fact will start reducing the total output. The example which I find is the easiest to comprehend would be using fertilizer to grow more vegetables. Let’s say you start with a yield of 100 tomatoes in a garden with no fertilizer. Now let’s assume you can use one pound of brand X fertilizer in your dirt, and you raise the yield to 150. The principle is that 1 pound of fertilizer is not equal to 50 more tomatoes. You may add 2 pounds the next time and get 300 tomatoes, an increase of 150 for the 2nd pound. If you continue adding fertilizer however, the returns diminish. For example, a crop of 3 pounds might only produce 350 tomatoes, bringing the return of the 3rd pound down equaling the 1st. Keep this up and a crop with 4 pounds might actually still produce 350, bringing no additional returns. This is the law of diminishing returns. 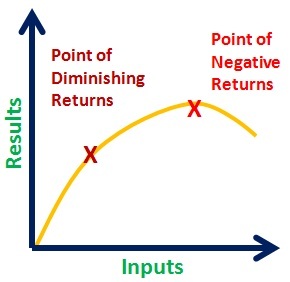 The Law of Diminishing Returns: There comes a point in all things, where too much of something starts producing less results. The principle continues, where a 5 pound crop will only produce 300 tomatoes, bringing a negative return, and a crop with 10 or 15 pounds might drop the total yield to 75, leaving you worse than where you started having no fertilizer, since now you also don’t have enough regular dirt to feed the plants. Now, I’m not a horticulturist, so my last example might not make sense with how fertilizer actually works, but the principle being explained is what it important. I can say this principle is definitely true when you consider the number of employees at a fast food restaurant; we may feel that they could always use more employees than what they have, but there is still a point when they would just start getting in each other’s way and not being able to serve you as fast. There are actually two facets that I see here. One in terms of what the government or company can accomplish, and the other is what the citizens or employees can get out of it. Anyone working in a big company has probably heard the complaint, if they haven’t complained themselves, about how there is too much bureaucracy or paperwork to deal with. Maybe they find that there are too many managers or supervisors and too few employees doing the actual work. In these situations, it takes a lot longer to get things done, because we have to wait upon the appropriate signatures, or have to spend too much time writing all the reports. Although a lot of that might be important to combat the first few laws, there is always a point where more bureaucracy will produce much less results, and do little for combating the first 3 laws of decline. This same principle applies to the government, except that unlike a business where it is the owners and managers who worry about the bottom line, it is all the citizens that suffer the consequences. Since the government is not a business itself, it has no service it is selling for profits. Its revenue comes from taxes. If it forms a new branch or department, it doesn’t have to worry about people go to the competition if the cost of running the department gets too high; people aren’t given much of a choice about whether or not to pay the taxes required to cover the costs. They can’t shop around for a more efficient government, buying services from them instead. Their only choice is who they vote for, or don’t vote for, in the future. So as we get more and more government agencies to do something for the people (or for itself one might argue in some cases), the costs get passed on to the people via taxes, debt to be paid later through taxes, or devalued money from inflation. At the same time, the more government agencies you get, the bigger they get, the less they can accomplish. This happens partly in the same manner as too much bureaucracy in a business with an approval processes, and confusion about who ends up being responsible for what. The other side of this is how you can get multiple agencies responsible for the same thing, and they either get in each others way, or simply do the same things; they sometimes duplicate exactly what another agency does, like giving grants to a certain companies twice for the same thing. A recent article I found from April in the USA Today shows just a few of these examples in the United States; It is worth a read. Another area affected by the law of diminishing returns is what people get from government handouts and what they can accomplish with them. As more people are given money from the government for things such as unemployment insurance, welfare, business subsidies, and any other program that helps people with a need, there is less that can be done with them. This is due to inflation, as any good economics book that talks about how prices are set will show how it is not truly the seller of the product that determines the price, but the consumer. This of course is assuming there is no monopoly enforced by the government on essential products or services. So if the prices are set by consumers, who are now getting more and more money from the government, these people have more money to spend which raises the prices of goods. These programs might be paid for by simply creating more money which tends to cause inflation, but burrowing money does the same thing. You may determine that these people need help from the government, but we need to take into consideration that the more people are helped this way, the less help we end up giving them due to the law of diminishing returns. The inflation issue will be argued by many people to be negligible in the face of how much help people in need are getting from these programs, but there are other ways in which the returns are diminished. Even if the purchasing power of each dollar received wasn’t being diminished, the quantity of dollars received eventually must be. As more people enroll in these programs, as will happen due to Bastiat’s Law and Gresham’s Law, especially when the economy is down, there will be less money to distribute to the recipients. If you’re in doubt about whether this happens, I invite you take a look at these charts I found on the US welfare spending, and this article about disability fraud from Mish’s economics blog. The spending power that the government has for these programs, and any other program, gets diminished as it borrows money to pay for the present programs. This is because of the interest it has to pay on the debt. The more debt it takes on, the more interest it has to pay in the following years budget. As money gets siphoned to interest payments, it leaves less money available for government programs unless people get taxed more, we print more, or we borrow even more just to pay for the current borrowing costs. We can go on and on with examples in these areas, as the idea if inflation is a an example on its own, but I think we have the important points. More is not always better, and in fact less can often mean more. The longer we wait to do something about these laws we’ve discussed, the more we run into the 5th law of decline; the Law of Inertia. Great resource! Thank you for making this. Thank u so much for this good examples and readings re law of diminishing returns!